I think that we all know how Clavia’s development strategy works. The company have three major keyboard technologies — a virtual analogue synth engine, a modelled Hammond organ and Leslie engine, and a sample playback engine — and combine these in various ways to create different ranges of instruments. Having done so, they have over the years made incremental improvements to each and advanced the model number, such that we now have the Nord Lead 4 synth, the Stage 2 and Electro 5 multi-keyboards, the C2 organs, and the subject of this review, the Piano 3. Despite being named a piano, the Nord Piano 3 comprises two sample-playback engines: one devoted to keyboard samples, and the other (the so-called Sample Synth) covering a wider palette of sounds. The outputs from the two engines are then passed down a signal path comprising six effects sections: five that can be applied individually or to both signals (or neither), followed by a global reverb section. Despite a few additional features, the simple control surface and straightforward menus of its predecessors (the aptly named Piano and Piano 2) have survived almost unscathed, and it remains simple to create Piano 3 Programs using either or both engines and (within their limitations) any combination of the effects. Firstly, there’s the keyboard itself. I’m not generally a huge fan of Fatar’s weighted keyboards — that’s not to say that they’re bad, but they haven’t always convinced my fingertips that they’re playing a ‘real’ piano. In this regard, the Piano 3’s new ‘Triple Sensor keybed with Virtual Hammer Action Technology’ is a step forward from previous versions. It feels perfectly even to me, and I like the subtle difference in weight from the lowest keys to the highest. The repetition speed also seems to have been improved and, if it isn’t quite up with the best from the classical world, it’s certainly not a problem. Concert pianists would probably prefer a heavier touch, but I’m confident that the huge majority of gigging musicians will be very happy with it. In fact, I like the feel and response very much, and would be delighted to perform live and to record with one of these. Unfortunately, some of the subtleties generated by the triple-sensor technology are not supported by MIDI so, if you’re recording, you should switch Local Off and play using a looped-back MIDI signal to hear what will later be reproduced. This isn’t Clavia’s fault, but it’s a shame nonetheless. Of more concern, some owners have reported that the Piano 3’s keybed develops a knocking sound after a few weeks of use. I checked the review unit carefully, and it exhibited no such problem. However, it was a brand-new instrument so, if a fault is eventually to develop, it hasn’t yet had time to do so. Visually, the most noticeable improvement lies with the adoption of the OLED screen that replaces the previous LCD. While it remains tiny by modern standards (no mobile phone would want to be seen with one) it’s crisp and bright, and will serve well on stage. But more significant changes are tucked away inside. Strangely, the program memory has dropped from 240 slots to 200 slots, although this is countered by a welcome doubling of the piano sample memory from 500MB to 1GB, and of the Sample Synth memory from 128MB to 256MB. To be honest, I’m not sure why Clavia restricted the latter to just 256MB. In these days of increasingly capacious and cheap flash RAM, this seems stingy. The Sample Synth itself has undergone another important improvement: despite losing one voice (the maximum polyphony has dropped from 16 to 15 voices), it has gained a velocity-sensitive low-pass filter. Although you have no access to the underlying parameters, this is a big improvement. Nonetheless, I still think that the use of the word ‘synth’ is an exaggeration; the Sample Synth remains a sample player, but it now affords a greater degree of dynamic control than before. As on its predecessor, the Piano 3’s six effect sections comprise modulated effects in Effect 1 and Effect 2, plus delay, equalisation, amp modelling/compression and the global reverb. Three of these sections — the delay, EQ and amp/compressor — appear to be largely unchanged from the Piano 2, but there are some significant changes in the Effect 1, Effect 2 and reverb sections. Turning first to Effect 1, there are, as before, tremolo and auto-panning effects, but where the Piano 2 offered just auto-wah, the Piano 3 offers wah/auto-wah and a ring modulator. Furthermore, it’s now possible to control each of these effects using an expression pedal, altering the depth of the tremolos and pans, the rate of the ring modulator’s oscillator, and the cutoff frequency of the resonant low-pass filter that generates the wah effect, turning it into a wah-wah pedal. Similarly, we find that the second flanger has been discarded in Effects 2, and a Vibe effect (which, on previous models, was described as being based upon “a desirable foot pedal”) has replaced it. Furthermore, a Deep mode has been introduced which, as the name implies, increases the depth of the chosen effect. Finally, the six reverb selections in the Piano 2 have been replaced by three options plus a ‘bright’ button, which may well amount to the same thing. I have been a fan of Clavia’s pianos since I first heard the XL version of the company’s Bösendorfer Grand Imperial when reviewing the Nord Stage 2 HA88. My only complaint at the time was that I would have had to buy the Nord Triple Pedal to access the pedal noise, half-pedalling, sostenuto and ‘soft’ functions, but this is supplied as standard with the Piano 3, so I’m a happy bunny. The Grand Imperial isn’t included in the factory selection but, as with other Nord keyboards, it’s the work of just a few minutes to launch the Nord Sound Library and replace factory sounds with alternatives, then use the organise functions to move the sounds and Programs to the locations you want. I did this to compare the new flagship ‘Italian Grand Faz XL’ with the Bösendorfer and found that the Fazioli is more precise, while the Bösendorfer retains the large, rolling character that I like so much. Other favourites have also survived, including the Petrof 132 upright, various electro-mechanical pianos, and the evocative harpsichords. 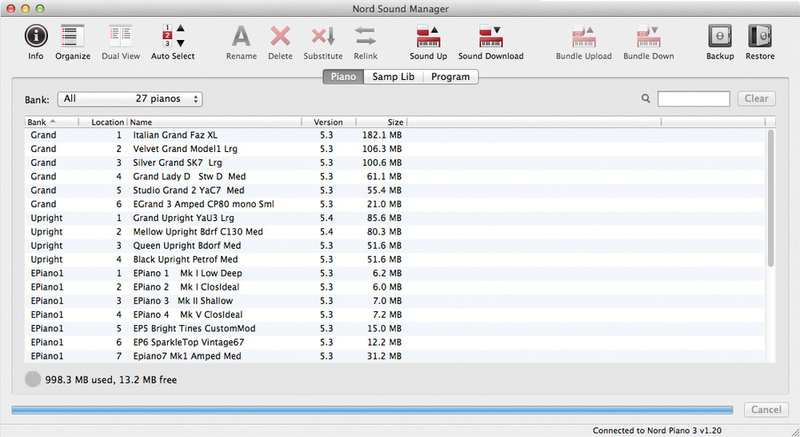 The Nord Sound Manager allows you to load, replace, delete and organise instruments in the Piano 3’s memory. Likewise, changing the sounds in the Sample Synth is straightforward, with a good range of orchestral instruments, synths and Mellotron sounds available, amongst others. If any class of instrument can be said to be poorly represented in the library, it’s organs, of which there are just five. I wonder why? Well, no I don’t. If you want organs, Clavia would much prefer that you purchase a Stage model, an Electro, or even a C2 or C2D organ. But if you’re wedded to the idea of playing organ sounds on the Piano 3 (which, in itself, isn’t a great idea because of the weighted keyboard) you can use the Nord Sample Editor to convert your own samples into the appropriate format and load these. But although Sample Synth is able to produce a pleasing range of high-quality sounds — layered with the piano, positioned either side of seven pre-defined split points, or even played in isolation — the Piano 3’s name is a dead giveaway: it’s at its best when used as a pure piano. Despite most of the physical controls sending and receiving MIDI CCs, it offers no performance controls — not even pitch-bend or modulation wheels — no real synthesis and no master keyboard functions, and its keyboard is aimed purely at making you believe that you’re playing a grand piano. If you try to push it beyond its limitations, you’re simply using the wrong instrument. As you might expect, there’s a fair amount of competition. Instruments such as the Roland RD800, the Kawai MP11 and the Yamaha CP4 have garnered many friends in recent years and, if you’re prepared to extend your horizons somewhat further, there are some excellent pianos in workstations such as the Kurzweil Forte, Artis and PC series, as well as the Korg Kronos. Nevertheless, there’s something rather endearing about the Nord. Sure, there’s no way that I can justify it to you on the grounds of price or flexibility, but were I to be asked which dedicated piano I wanted for a tour (and I didn’t have to buy it myself) I would choose a Nord Piano or Nord Stage 88 without hesitation. Mind you, if I had to spend my own money, I would be tempted to find a solution that also offered organs and synthesis, multi-timbral effects, and far more in the way of splits and layers for that amount of money! Clavia’s design and marketing philosophies have served the company extremely well, and you’re unlikely to go to a major concert or festival without being able to spot one of their distinctive red keyboards somewhere in the rig. Of course, everyone has their own taste in pianos, and you’re as likely to find someone who dislikes a given model because “it sounds and feels nothing like a real piano” as you are to find others who love the same instrument because, for them, “it sounds and feels precisely like a real piano.” The Nord Piano 3 won’t escape this fate but, with the right samples loaded and the response tailored to suit your style, it is a very fine instrument indeed. The rear panel is rather sparse. Audio is output from a single stereo pair of unbalanced quarter-inch sockets plus a quarter-inch stereo headphone socket. I’m a little disappointed by this; given that the Piano 3’s raison d’être is as a high-quality gigging instrument, I would have hoped for balanced analogue outputs plus some form of digital audio output. Furthermore, a pair of analogue stereo outputs (one for the pianos and the other for the Sample Synth) rather than the current Piano L/Synth R option wouldn’t have gone amiss. Next to the outputs, you’ll find a 3.5mm input. This is provided for accompaniment purposes, but audio presented to this is directed only to the headphones output. This is daft. I can understand that you may want to practice under headphones, but equally you may not. Two pedal inputs are provided, one for sustain (damper) and one marked volume, but which is actually an input for an expression pedal that can control the volume or the variable parameters in the Effects 1 section. The sustain input supports the Nord Triple Pedal, which provides half-pedalling, sostenuto, dedicated sustain/latching for the sample synth, and una corda (soft) pedalling in addition to simple damping. MIDI connectivity is provided via five-pin MIDI in and out sockets and the USB interface, the latter of which also supports data transfer for OS updates, loading from the sample libraries, and backing up. MIDI streams are sent and received from both interfaces simultaneously, so you may have to be careful that you don’t confuse the wee beastie by sending duplicate or conflicting data to it. Finally, there’s an IEC input for the 230V (not universal!) power supply. With the right samples loaded, it’s still my stage piano of choice. Doubling the sample memory is a big step forward from the Piano 2. The improved keybed and improvements to the effects are welcome. It lacks individual stereo outputs for the piano and Sample Synth sections. It lacks digital audio outputs. Despite having two high-quality sample playback engines, the Piano 3 is at its best when used in the way that its name implies and, if you’re looking for a stage piano, it has to be on your list of instruments to audition. As with all pianos, it may not be to everyone’s taste, but I have still to hear a digital piano that I prefer to Clavia’s Bösendorfer Imperial XL which, when played on the Piano 3, sounds and feels superb.